of memory, loaded with HP-UX 11.23 64bit and RamDisc Plus. 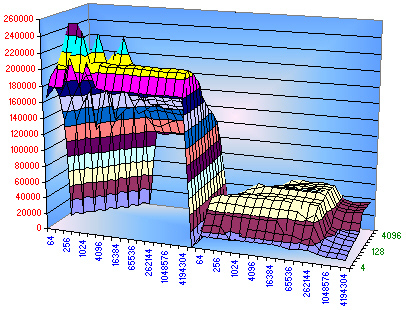 The chart on the left merges two IOzone write performance benchmarks between RamDisc (left) and the VA7400 (right). The vertical scale is Kbytes per second represented in red. 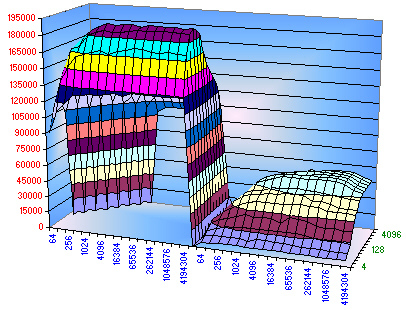 The bottom scale is File Size in Kbytes represented in blue. 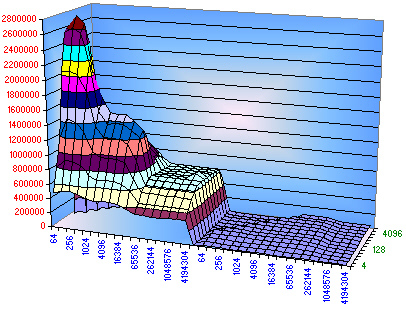 The depth scale is Transfer Size in Kbytes represented in green. In this bencmark, RamDisc peaks at 190,785 Kybtes per second while the VA7400 peaks at 56,093 Kbytes per second. The processor cache and memory buffer cache are disabled. However, the 1GB internal RAID cache remains available during the test. The chart on the left merges two IOzone read performance benchmarks between RamDisc (left) and the VA7400 (right). 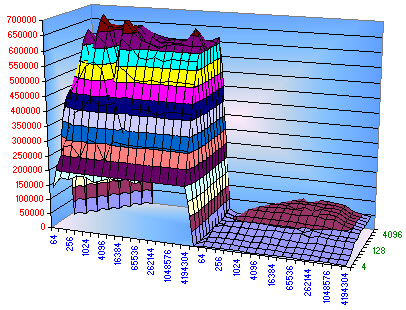 In this bencmark, RamDisc peaks at 254,597 Kybtes per second while the VA7400 peaks at 61,049 Kbytes per second. The processor cache and memory buffer cache are disabled. However, the 1GB internal RAID cache remains available during the test.